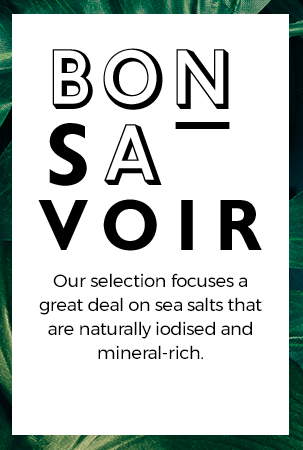 Harvested along the Audois coastline, this exceptional fleur de sel will delight your taste buds. Expertise and respect for tradition make the Gruisson fleur de sel the perfect seasoning for any dish. Albert Ménès lemon fleur de sel is a masterful and harmonious blend of Guérande fleur de sel and lemon zest. The delicate taste of fleur de sel here marries with the gentle fruity acidity of Albert Ménès lemon zest. This salt is collected on the volcanic islands that give it its name. It has a surprising texture and pigment. It has bite, as well as a fine and balanced taste of hazelnut. Its black colour will jazz up your dishes and be a real hit at your table! Ginger pairs well with many dishes thanks to its freshness and spiciness. When used in Madagascan fleur de sel, it can add a touch of originality to pork in caramel, a marinade or a vinaigrette. These pink salt crystals can be grated at the table for a fun and original dinner. This Persian sapphire blue salt from Iran is used like fleur de sel. Made up of deep blue crystals, it adds a luxurious, exotic touch to your everyday cooking. For over five centuries, Bex salt has been used by the Swiss because of its exceptional taste. Preserved in the heart of the rocks for 200 million years, this Alpine salt is made with respect for tradition. Inherited from the ancestral methods of salt drying used by the Vikings, smoking with apple wood gives our Sea Salt a subtle fragrance. It is presented in an elegant table mill. This mixture of powerful white Penja pepper and delicate fleur de sel will boost the flavour of your grilled meats, vegetables and fish. This recipe inherited from the Vikings never ceases to amaze. This fine salt thrills lovers of smoked flavours and will go down a treat in your gratin dauphinois, eggs or raw vegetables dipped in salt. Straight from the heart of the Himalayas, this salt is pure and dry. Ideal for a salt grinder, it will season your dishes. This salt takes the shape of pearls washed up on the seashore. It has been polished over the years by the waters of Lake Assal in Ethiopia. The finishing touch for all your dishes is the pure and authentic Ifaty fleur de sel, harvested by the Vezos, the Madagascan fishing community. A mixture of fleur de sel and vanilla for sweet and sour dishes, as well as duck. Ideal for fish. This fine salt never ceases to amaze. It thrills lovers of smoked flavours. A blend of yuzu and fleur de sel, it will bring a touch of freshness and bitterness to your summer salads and seafood dishes. The amazing structure of the crystals give this black pyramid sea salt from Cyprus a remarkably flaky texture. The black colour adds an unusual decorative touch. This finishing salt can be used like fleur de sel, and is particularly good on raw vegetables, seafood and fish. A pure, crystalline salt harvested in the Egyptian desert to embellish the presentation of your dishes. Straight from the foothills of the Ergourz, in the north of Iran. These crystals have been formed over thousands of years in the Persian seas. This salt has a bright and mildly peppery flavour. It adds a delicious touch to your everyday cooking. Fabulous on salads, vegetables, white meats and fish. Excellent in creamy blanquettes. Be tempted by this box of three mini salts: Guérande sea salt with summer truffle 3%, Himalayan rose salt with bianchetto truffle 1%, and Sicilian white salt with black truffle 1%. This makes an ideal gift box, or for the pleasure of giving your dishes a totally new flavour! This rock salt displays blueish hues. This dry salt, which can be used in all your dishes, is the culinary change you’ve been looking for. An ideal blend of spices for seafood, fish and rice. This delicate fleur de sel is combined with lemon, orange and coriander notes. Hawaiian red salt possesses a slight hazelnut taste and owes its colour to red clay. This salt will add a very original finishing touch to your dishes. Be tempted by this salt that's delicately flavoured with truffle! It will spice up your mixtures. Recipe Diamond salt with roasted spices. A change from traditional table salt and a way to brighten up your carpaccios, fish, mixed salads and vegetables, these pink salt crystals blended with a delicious mix of roasted spices are ideal. This gourmet salt is delicious with omelettes, creamy vegetable soups, white rice or risotto, sautéed potatoes and grilled or roasted poultry and meat. It is particularly brilliant on grilled tuna steaks. This Himalayan pink pearl salt from Pakistan can be used like course salt or in a salt grinder. Made up of pale pink crystals, it adds a luxurious, exotic touch to your everyday cooking. This lemon zest fleur de sel goes perfectly with fish, shellfish, mayonnaise and avocado salads. This fleur de sel blended with Espelette chili is ideal with cheese to add strength and finesse, but also on Basque dishes or even a chocolate fondue. When the fine fleur de sel meets the colours of Iranian saffron, it creates the perfect blend for your fish, shellfish and asparagus. Hawaiian black salt is obtained by adding lava rocks to sea salt basins; its crystals bring a fresh edge to your dishes. This delicate Cyprus salt with saffron is slightly crisp and accompanies pan-fried crayfish, mussels in cream, fish papillotes, or white asparagus. This salt has been polished by the waters of Lake Assal in Djibouti. This small size is ideal as fine salt or table salt.